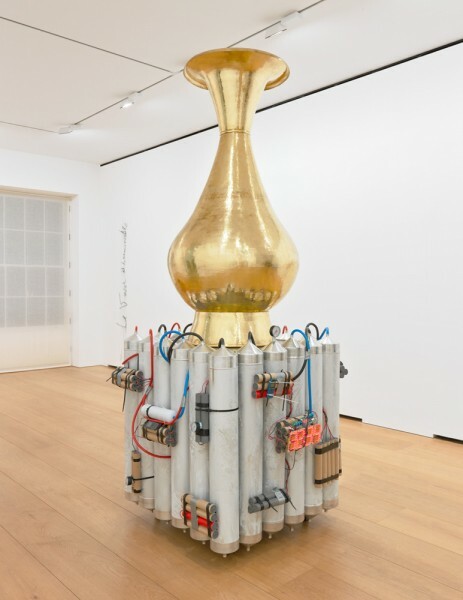 A giant, golden urn ‘Le Vase Abominable’ dominates this exhibition of recent work by Adel Abdessemed and matches the height of the artist. Strapped to the base are a series of gas tanks and explosives with a digital clock counting down to zero. It is a confrontational object marrying craft, luxury and danger. Operating as an absurd self-portrait, the object embodies both aggressor and victim. An ostensibly ‘Orientalist’ and desirable artefact is transformed into something to fear. This satirical thrust characterises the rest of the works on show and they are invested with historical and contemporary resonance. The exhibition does not illustrate a reassuring ‘hybridity’ across cultures but rather produces jarring encounters expressed in diverse media such as drawing, assemblage and animated film. A series of smaller vases made of clay, salt, rubber, gold and marijuana sit on empty ammunition boxes like trophies of war rather than commodities or vessels. This thematic interest in aggressive acquisition and projection of power permeates the exhibition. And upstairs we meet a rendition of a naked child running from horror, ‘Cri’, which appropriates an iconic scene from the Vietnam and translates it into opalescent blocks of carved ivory. Despite the gallery’s assertion that the ivory is ethically sourced, it is still a gory representation of human agony using a material associated with illegal animal slaughter. Naturally this confers an added frisson to the figure. Subtlety is neglected and instead Abdessemed sets up intentional provocation. Charcoal drawings of singular unidentified soldiers achieve a universal summation of modern warfare. These young men hide beneath their uniforms and equipment, exempt from responsibility, appearing life-size as if standing a few metres away in real time and space. As a nod to the host city, the artist has a made a drawing of the historic British, throne housed in Westminster Abbey. It represents archetypal power, faceless and unaccountable, casting a long shadow across a bleak landscape. Abdessemed demonstrates technical skill and wryly addresses contemporary anxieties about the instability of the modern world. The exhibition manages to feed a prevailing paranoia and unease, but what’s missing is any confident ethical or political position. Instead, he tends to fall back on mocking subversion to achieve a rather theatrical and ultimately ephemeral effect.